Church History: The Mediaeval Church and the Reformation. Recently, we discussed the arrival of Christianity in Ireland, the contribution of the Irish monastic tradition to the spread of Christianity throughout Continental Europe; and the reshaping and reform of the Church in Ireland prior to the arrival of the Anglo-Normans. I imagine that many of us, in our imaginations, make a mental leap, between the Early and Celtic Church straight through to the Reformation. I want us this morning to look at the mediaeval Church, to consider its problems and its riches, the legacy and the burden it has left us, and then to look at the Reformation. Let us engage in a little bit of random thinking for a moment. What images come to mind when you think of the mediaeval Church? 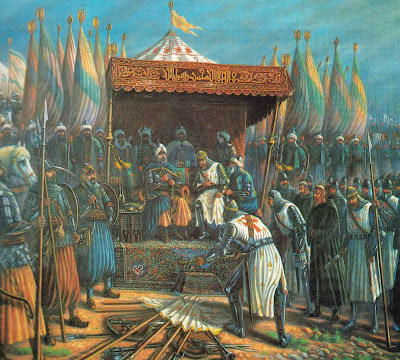 ● The rise of Islam and the Crusades? ● The campaigns against the Cathars, Lollards and Hussites? ● The Papal schisms and the Papal exiles in Avignon? ● The rise of the monastic houses? At the same time as Patrician Christianity was being formed on this island, the wider Church was debating doctrine, formulating the creeds, finalising the canon of Scripture, and dealing with heresies, all part of the agenda of the first great councils of the Church. Doctrine was being affirmed, heresy was being combatted, and unity was being expressed in the councils and the Creeds. 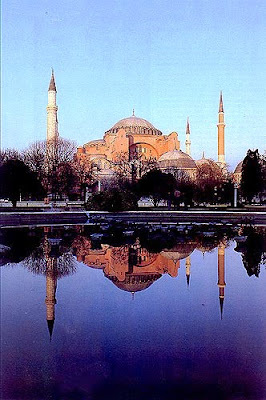 The locus for all these activities is the Eastern Mediterranean, particularly Constantinople, Antioch and Alexandria, the Syrian and Egyptian deserts, and the great commercial and cultural centres of western Anatolia, such as Ephesus and Chalcedon, across the Bosporus from Byzantium. When Constantine moved the capital of the Empire from Rome to Byzantium in 330, the centre of Christianity moved from the Old Rome to the New Rome, and the Eastern rim of the Mediterranean basin became the centre of Christian intellectual activity and debate as the western empire was crumbling and collapsing. But divisions began to afflict the Eastern Church too, as illustrated by the fate of Saint John Chrysostom. 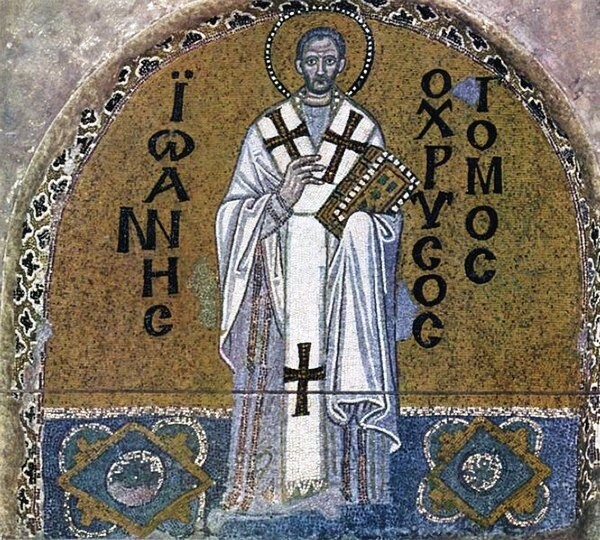 Saint John Chrysostom (Ἰωάννης ὁ Χρυσόστομος, ‘John the Golden-Mouthed’ (ca 347–407), Patriarch of Constantinople, is known for his eloquent preaching and his denunciation of the abuse of power and privilege. He has given his name to the Divine Liturgy of Saint John Chrysostom and the ‘Prayer of Saint Chrysostom’ in The Book of Common Prayer. He was a monk and a priest in Antioch when he was appointed Patriarch of Constantinople in 397. He quickly became unpopular with the ruling class, the wealthy citizens and the clergy of Constantinople, and his reforms proved unpopular. At a synod in 403, he was deposed and banished. But on the night of his arrest an earthquake hit the city; the Empress Eudoxia saw this as a sign of God’s anger, and John was reinstated. But this peace was short-lived, and John compared Eudoxia with Herodias, who ‘desires to receive John’s head in a charger.’ This time, he was banished to the Caucasus in Armenia. In exile, he appealed for support to three Church leaders in the West, the Bishop of Rome, Pope Innocent I, the Bishop of Milan and the Bishop of Aquileia. But the three bishops Pope Innocent sent to intercede on John’s behalf were not allowed to enter Constantinople. He was exiled to furthest eastern end of the Black Sea, and on that gruelling journey he died in Comana in Cappadocia on 14 September 407. After his death, relations between Rome and Constantinople were broken off, and were not restored for 11 years. Eventually, his relics were returned to Constantinople in 438. But his deposition, his appeal to Rome, the treatment of the Roman delegation by Byzantium, and the breach in communion for over a decade set the agenda and paved the way for further divisions between the Church of the East and the Church of the West. Meanwhile, two further divisions beset the Church in the East – the heresies labelled as Nestorianism and Monophysitism. Monophysitism was born in the theological School of Alexandria, which began its Christological analysis with the divine eternal Son or Word of God and sought to explain how this eternal Word had become incarnate as a man. In contrast, the School of Antioch, the birthplace of Nestorianism, began with the human Jesus of the Gospels and sought to explain how this man is united with the eternal Word in the Incarnation. Both sides agreed, of course, that Christ is both human and divine. But the School of Alexandria emphasised the Divinity of Christ, including the concept that the divine nature was itself ‘impassible’ or immune to suffering. On the other hand, the Antiochines emphasised humanity of Christ, including the limited knowledge and growth in wisdom of the Christ of the Gospels. In reality, individual Monophysite and Nestorian theologians rarely believed the extreme views attributed to them by their opponents, even if some of their followers may have. Nestorius (Νεστόριος, ca 386–ca 451) was the Patriarch of Constantinople from 428 to August 431. He rejected the title Θεοτόκος (Theotokos, ‘God-bearer’ or ‘Mother of God’) for the Virgin Mary, and he was understood by many to imply that he did not believe that Christ was truly God. However, Nestorius actually was concerned that the use of the term Θεοτόκος ran the risk of venerating the Virgin Mary as a goddess. Saint Cyril, Patriarch of Alexandria, accused Nestorius of heresy. Nestorius sought to defend himself at the First Council of Ephesus in 431 – a year before Saint Patrick is traditionally said to have landed in Ireland to begin his mission. The council formally condemned Nestorius for heresy, he was deposed as Patriarch, exiled to Upper Egypt, and was anathematised in 451 at the Council of Chalcedon in 451. The Assyrian or Chaldean Church, which also calls itself the Church of the East, never accepted that he was a heretic, but the Second Council of Constantinople (553) confirmed the condemnation of Nestorius. Yet, by the early seventh century, Nestorian missionaries were firmly established in China under the Tang Dynasty (618–907). The so-called ‘Nestorian stele’ records a mission under Alopen, a Persian Christian, who introduced Nestorian Christianity to China in 635. Following the Muslim conquest of Persia in 644, the Persian Church became a protected faith community under the Caliphate, and flourished in China and India. The Monophysite concepts developed in reaction to Nestorianism. This new teaching asserted that Christ had but one nature, his human nature being absorbed into his divinity. This doctrine was condemned in 451 at the Fourth Ecumenical Council, he Council of Chalcedon. The Chalcedonian decrees were accepted in Rome, Constantinople and Antioch, but were resisted strongly in Alexandria and in the Egyptian monasteries. This led eventually to the schism between the Chalcedonian churches and the Oriental Orthodox churches. Monophysitism was later attributed mistakenly to the non-Chalcedonian churches, including the Armenian Orthodox Church, the Egyptian and Ethiopian Orthodox churches (Copts), and many of the Syrian Orthodox Churches in the Middle East and India, although today it is condemned as heresy by the modern Oriental Orthodox churches. Later, monothelitism – the belief that Christ was two natures in one person except that he only had a divine will and no human will – was an effort to bridge the gap between the Chalcedonians and the Monophysites. However, it too was rejected by the Chalcedonian synod, despite at times having the support of Byzantine emperors and once avoiding being condemned by the Pope of the day, Honorius I.
Orthodoxy was now triumphant in Byzantium, and that triumph was symbolised by Aghia Sophia (Ἁγία Σοφία), the great Church of Holy Wisdom, which would remain the largest cathedral in the Christian world for almost 1,000 years. But the greatest threat to the East at the time was posed not by internal divisions, not by the rival claims of Rome and the Church in West, but by the rise of Islam. The fertile crescent of the Middle East is the birth place of great ancient kingdoms such as Babylon, Jerusalem and Persia, and of three of the great surviving monotheistic faiths, Judaism, Christianity and Islam. 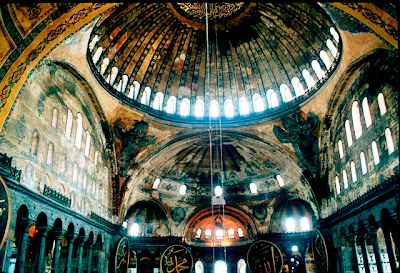 Just five centuries after the start of Christianity, Muhammad was born ca 570, little more than a generation after the completion of Aghia Sophia, and Islam would rise as a religious, political and social force in the Middle East. Muhammad was a member of the Quraysh tribe in Mecca, Around 610-613, he claimed to have received revelations from God through the Archangel Gabriel that he was a prophet in the same line as Abraham, Moses and Jesus, and calling him to preach the religious message of Islam. His monotheistic message was not well received in Mecca, a centre of polytheistic worship that profited from pagan pilgrims to the Kaaba; the early Muslim converts faced persecution, and Muhammad and his followers were forced flee to Medina in the hejira in the year 622. In 624, the Muslims attacked and defeated a heavily-guarded merchant caravan in the Battle of Badr, the first major battle in the Muslim conquest of Arabia. Over the next few years, he expanded his territorial control and waged war with both pagan and Jewish Arab tribes, his power and influence grew and relations with the three Jewish tribes of Medina deteriorated. In 630, Muhammad conquered Mecca and over the next two years he sent his armies throughout western Arabia to conquer the remaining tribes. He demolished the temples of his defeated enemies and refused to accept their surrender until they agreed to convert to his religion. 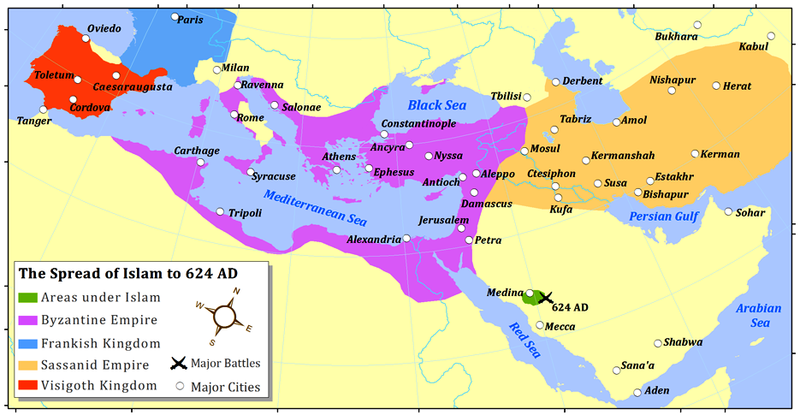 After the death of Muhammad in 632, the Muslims were led by a series of Caliphs, his closest companions, who continued his aggressive expansion, first in the Arabian peninsula and then attacking the two major powers in the region, the Byzantine Empire of the Eastern Mediterranean, and the Sassanid Empire of Persia, who had been in a state of almost continuous war with each other for an entire century and who were now were weakened and unable to resist. 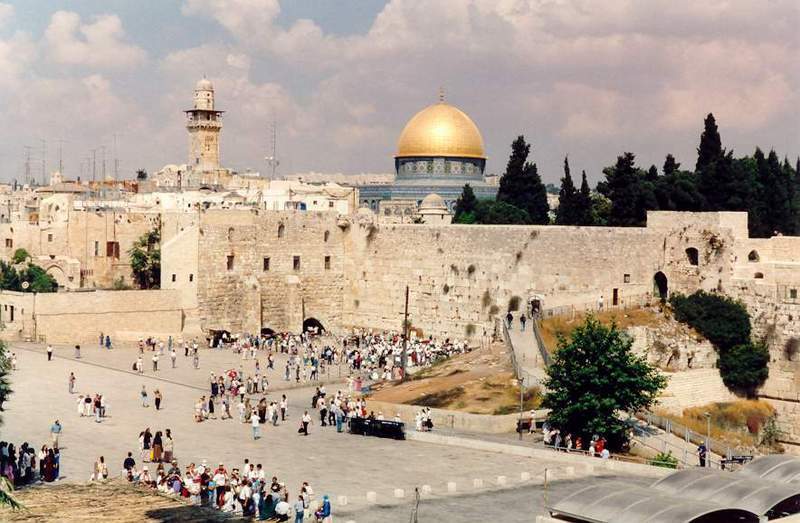 In the year 638, Jerusalem was captured by the Muslims. Muslim armies went on to conquer almost the entire Middle East, including the Levant, Egypt, and Persia. Islam spread quickly to northern Africa and east as far as India. Once all of North Africa had come under the rule of the Caliphate, the Muslim forces invaded Europe, and pressed north, almost reaching Paris before Charles Martel defeated the Muslim armies at the Battle of Tours in 732. Should we regard this as the battle that saved Europe for Christianity? Certainly, the expansion of Islam was astonishing in its days. In just 100 years, Islam had conquered all of Arabia and then expanded, conquering vast territories as far west as Spain and as far east as Afghanistan. The Islamic Caliphate was now the largest empire the world had yet known, controlling some of the most important centres of civilisation. Of the five Christian Patriarchates, three had fallen under Islamic rule – Jerusalem, Alexandria, and Antioch. Indeed, there is evidence that in some places, including Alexandria in Egypt and Damascus in Syria, Christians who had been living under oppressive rule welcomed the Muslim conquerors. Only Rome and Constantinople remained in Christian hands. From this point on, much of Mediterranean history would be marked by the struggles between Christianity and Islam, with Christianity dominating the northern shores of the Mediterranean and Islam the southern shores. The battlegrounds would be Spain, Jerusalem, Constantinople, and the islands caught in the middle. In all these debates, Rome seemed to be little more than a provincial backwater, and it took centuries for the ‘Eternal City’ to claim or reclaim its authority and its claims to primacy. Saint Jerome translated the Bible in his Latin Vulgate version in 404. But only six years later, in 410, Rome was sacked by Alaric and the Goths, sending shockwaves throughout the civilised world. It is seldom remembered that Alaric was an Arian, and that he left the great churches of Rome untouched. Pelagianism rather than Arianism appeared to pose a greatest threat in Rome until Pelagius moved to North Africa and there he clashed with Augustine of Hippo. Nevertheless, the old order seemed to be crumbling and Christianity appeared to be under siege, inspiring Augustine to write his City of God (ca 413-427). Leo the Great, who became Pope in 440, was the first Bishop of Rome to assume the title of Pontifex Maximus, a title previously used only by emperors. But Leo was not present at the Council of Chalcedon in 451, and a year later, in 452, Attila the Hun and his forces arrived in Italy. 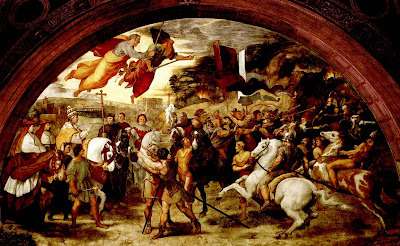 At an encounter in Mantua, Leo persuaded Attila and his forces to turn back from Rome, but the Vandals captured Rome in 455, and spent a fortnight looting and sacking the city. Less than two decades later, in 476, the German warrior Odoacer became the first barbarian King of Rome. The links between the Old Rome and the New Rome were now merely nominal and not always respected. 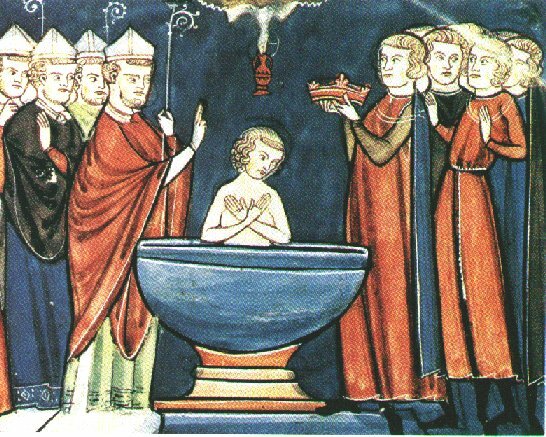 When the Frankish king Clovis sought to be baptised in Rheims Cathedral ca 500, he consciously modelled himself on the Emperor Constantine almost two centuries earlier. But the recovery of the Latin Church only truly begins with the Papacy of Gregory I, Saint Gregory the Great, who was Pope from 590 until his death in 604. He was the first pope to come from a monastic background, and he is revered by Roman Catholics, the Orthodox Church, Anglicans and Lutherans. Even Calvin admired him, and declared in his Institutes that Gregory was the last good pope. Gregory is credited with re-energising the Church’s missionary work in northern Europe. In 596, he sent Augustine on a mission to England, and he is counted as the first Archbishop of Canterbury. Rome was beginning its recovery and the defeat of the Muslims at Tours by Charles Martel in 732 prepared the ground for the reunion of the Frankish kingdoms. The link between the Frankish kingdoms and the Papacy was consolidated when Charles the Great, Charlemagne was crowned Holy Roman Emperor by Pope Leo III in Rome on Christmas Day 800. Although the Vikings were still plundering the monasteries of northern Europe, the Moors were ensconced in Spain and Jerusalem, and the Byzantine Empire was holding out in the East, the Vikings and the Slavs were learning to write, and Christian kingdoms were emerging throughout northern and western Europe. Western Christianity appeared to have triumphed in the face of adversity and the next four centuries, between 800 and 1200, saw a new relationship between Church and State. The monastic houses were providing renewal and learning, and Anselm was asking his great questions about God, Faith and Understanding. But the divisions already created between Greek East and Latin West continued to simmer. In a defence against the Arianism of the Visigoths in Spain, the filioque clause had been inserted in the Latin version of the Nicene Creed used in the West. By 800, it was being used in the chapels of Charlemagne. At first, its use was opposed by the Popes, and East and West agreed in Constantinople in 879 that all additions to the Creed were prohibited. But it was soon accepted quiescently; and finally it was accepted without any conciliar approval and against the wishes of the Church in the East, to the point that delegates from Rome to Constantinople even accused the Greeks of removing the filioque from the Creed. The Church in East had already been weakened externally by the assaults from its Muslim neighbours and internally by the frictions created by the iconoclast controversy. The debate about the filioque was a result of rather than the cause of the divisions between East and West. 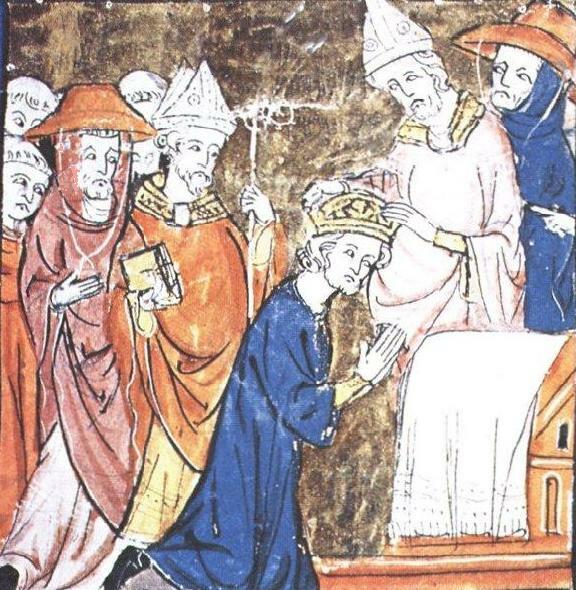 On16 July 1054, the Papal Legate, Cardinal Humbert, stormed into Aghia Sophia with his retinue, interrupted the Divine Liturgy, marched up to the high altar, and laid down a Bull of Excommunication against Patriarch Michael Keroularios. The Patriarch responded in kind, and the schism, exacerbated by the Crusades, has continued to divide the Church ever since. By the time of the Church at the Great Schism between East and West, the Western Church was in need of consolidation, and two priorities, pressures or forces, one external and one internal, helped to provide that consolidation or focus in very different ways – the development of monastic and mendicant traditions, and the lessons and disasters of the Crusades. In many ways, those two movements are brought together in the person of Saint Bernard of Clairvaux, who is remembered for his efforts to reform the Benedictine monastic tradition, and for his zeal in preaching on behalf of the Crusades. The Crusades were a series of religious wars between 1095 and 1291, blessed by the Pope and the Church with the expressed goal of restoring Christian access to holy places in and near Jerusalem. 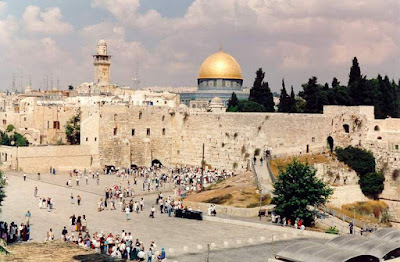 Jerusalem was first captured by Islamic forced in 638. When the Seljuk Turks defeated the Byzantine army in 1071, Christian access to Jerusalem was cut off. The Byzantine Emperor, Alexis I, feared the Turks would over-run Asia Minor and called on western Christian leaders and the papacy to come to the aid of Constantinople and to free Jerusalem from Islamic rule. In all, there were nine Crusades from the 11th to the 13th century, along with many “minor” Crusades. Several hundred thousand Crusaders came from throughout western Europe, but they were not under any one unified command. Their emblem was the cross, and the term ‘Crusade,’ although not used by the Crusaders to describe themselves, comes from the French term for taking up the cross. Many were from France and were called ‘Franks’ – the common term used by Muslims. Immediately, thousands pledged themselves to go on the first crusade. 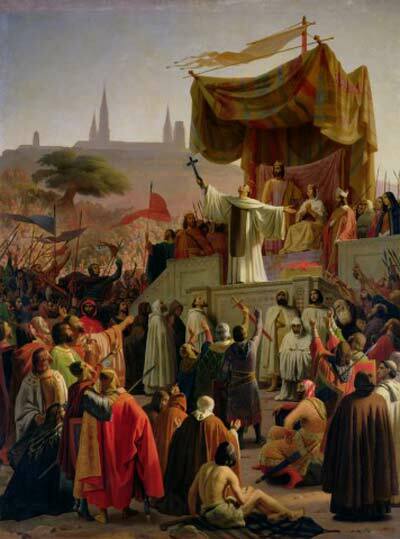 Pope Urban’s sermon at Clermont was the start of an eight-month preaching tour throughout France, and preachers were sent throughout Western Europe to talk up the Crusade. The first crusader armies set off from France and Italy on 15 August 1096, with only a fraction of their original forces finally reached the walls of Jerusalem on 7 June 1099. They entered the city on 15 July 1099 and proceeded to massacre the remaining Jewish and Muslim civilians, pillaging or destroyed the mosques and the city itself. 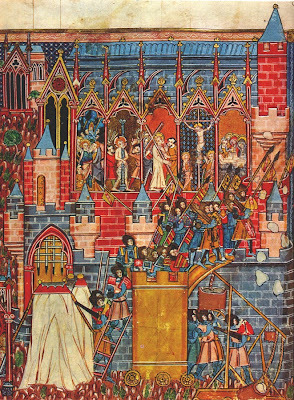 The historian Steven Runciman writes of the First Crusade as a barbarian invasion of the civilised and sophisticated Byzantine empire, ultimately bringing about the ruin of Byzantine civilisation. After a period of relative peace, the Muslims reconquered Edessa and a new crusade was called for by various preachers, especially Saint Bernard of Clairvaux. However, Bernard of Clairvaux was upset with the amount of misdirected violence and the slaughter of the Jewish population of the Rhineland. French and German armies under the King Louis VII and King Conrad III marched to Jerusalem in 1147 but failed to win any major victories. Even the pre-emptive siege of Damascus was a failure. By 1150, the kings of France and Germany had returned home without any gains. The divided Muslim forces and powers were united by Saladin, who created a single powerful state. Following his victory at the Battle of Hattin, he overwhelmed the disunited crusaders in 1187 and all of the crusader holdings except a few coastal cities. Saladin’s victories shocked Europe. When he heard of the Siege of Jerusalem (1187), Pope Urban VIII died of a heart attack on 19 October 1187. On 29 October, Pope Gregory VIII issued a papal bull calling for the Third Crusade. But the Third Crusade ended without Jerusalem being retaken. They lacked supplies, the leases on their vessels were running out when they turned on Constantinople and tried to place a Byzantine exile on the throne. In 1204, the Crusaders sacked the city and established the so-called ‘Latin Empire’ and a collection of petty Crusader states throughout the Byzantine Empire. 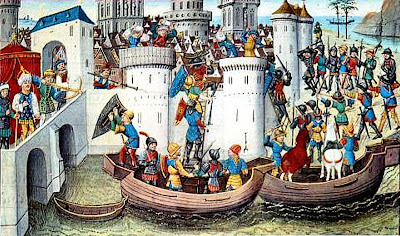 The Fifth Crusade is remembered for an incident in 1219, when Saint Francis of Assisi crossed the battle lines at Damietta to speak to the Sultan. 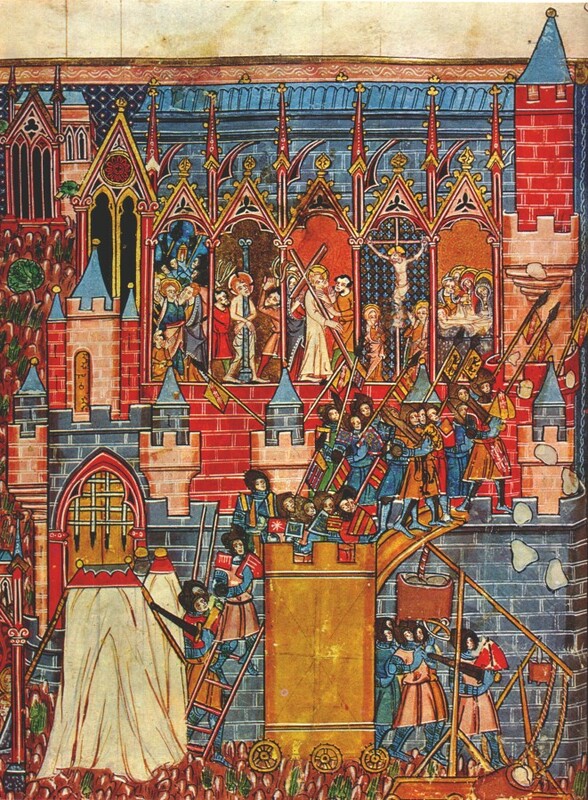 Emperor Frederick II launched the Sixth Crusade in 1228, but there were no battles in the Crusade, and Frederick signed a treaty with the Sultan of Egypt allowing Christians to rule over most of Jerusalem and a strip of territory from Acre to Jerusalem, while the Muslims had control of the Dome of the Rock on the Temple Mount and al-Aqsa Mosque. 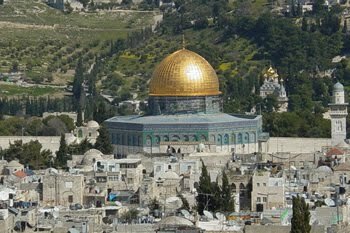 In 1244, the Muslims regained control of Jerusalem. The Albigensian Crusade was launched in 1209 against the heretical Cathars of Occitania in southern France. The ‘Children’s Crusade’ in 1212 ended with many of the children dying of hunger or exhaustion and most of the survivors being captured and sold into slavery. 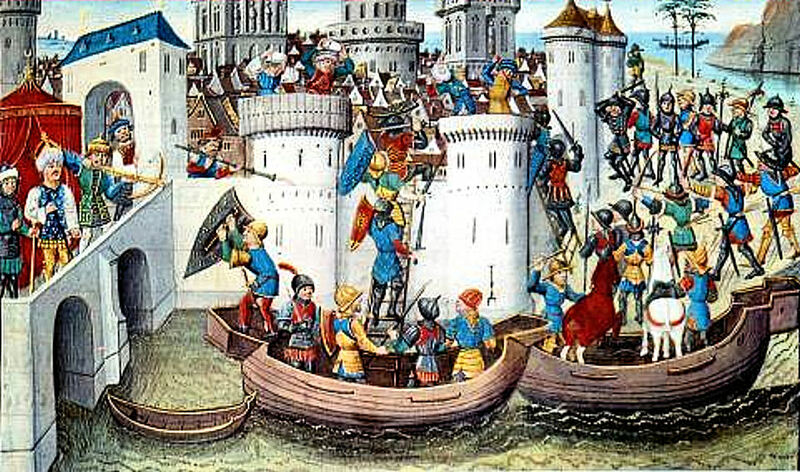 The Crusades had political, economic, and social impacts on western Europe. Later consequences were, on the one hand, the way they weakened the Byzantine Empire, which fell eventually to the Muslim Turks; and, on the other hand, a long period of wars in Spain and Portugal leading to a Christian conquest or reconquest of the Iberian peninsula. The Crusades allowed the Papacy to assert its independence of secular rulers and developed the arguments for the proper use of armed force by Christians, leading eventually to the development of the ‘Just War’ theories. The role of the monastic and mendicant orders at the time of the Crusades is crucial to their development. 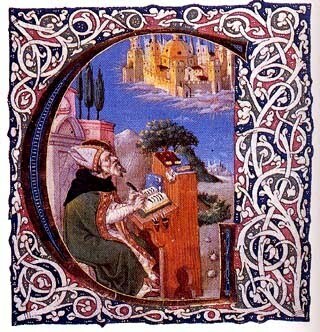 Saint Bernard of Clairvaux, responsible for the reform of the Benedictine tradition, “preached up” the Second Crusade; Saint Francis of Assisi crossed the battle lines at Damietta to speak to the Sultan in 1219 during the Fifth Crusade; and the Carmelites arrived in Europe as a loose group of hermits forced to leave the Holy Land in the wake of the failure of the Crusades. Two particular rules have shaped Western monasticism: the Rule of Saint Benedict and the Rule of Saint Augustine. But the monastic tradition has its roots in the Desert Fathers and a tradition that developed in Egypt and Syria. Within the Western monastic tradition, there are two key figures, Saint Benedict and Saint Bernard of Clairvaux. 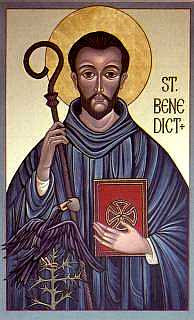 Saint Benedict of Nursia is the most influential figure in western monasticism. He was educated in Rome but soon sought the life of a hermit in a cave at Subiaco, outside the city. He attracted followers and with them he founded the monastery of Monte Cassino ca 520, between Rome and Naples. Saint Benedict was more focused on schools, and the education of the monks who followed his rule. He wished to reform the education throughout the monasteries so that a monk could be a better person, and more greatly achieve their quest of living a life like that of Christ. He set out the rule that led to him being credited with the title of Father of Western Monasticism. By the ninth century, largely under the inspiration of Charlemagne, the Rule of Saint Benedict had become the guiding rule for Western monasticism. In the 13th century, with the decline of the monasteries, new mendicant orders of friars were founded to teach the Christian faith. Within the mendicant orders, two principal groups of friars emerged: the Franciscans and the Dominicans. The Franciscans begin with Saint Francis of Assisi in the early 13th century. Saint Francis realised that as the monks became rich from their earnings, they ultimately started to become lazy and proud. His Franciscans believed in living in poverty and sought to survive by begging. The Dominicans or the Order of Preachers was founded by Saint Dominic de Guzman in the 13th century. He established a systematic and organised method of teaching the monks so they would be prepared to travel and preach to the people. Saint Dominic taught the most importance of linking the monastic rules with lives of poverty, chastity and obedience. He also emphasised charity and meekness. ● The Benedictines: founded in 529 by Benedict at Monte Cassino. They, stress the combination of work, prayer and study in the monastic life. ● The Augustinians, who evolved from the canons who lived under the Rule of Saint Augustine. ● The Carmelites (Whitefriars) who were founded ca 1206 and 1214, but claimed to have originated on the slopes of Mount Carmel. ● The Cistercians or Trappists, who developed out of reforms of the Benedictine tradition initiated by Saint Bernard of Clairvaux. ● The Dominicans (the Blackfriars), founded in 1215 by Saint Dominic. ● The Franciscans, who followed the lifestyle of Saint Francis and Saint Clare. 5, The advent of the Reformation. We have already seen that Celtic Ireland was a largely rural and agricultural society. On the other hand, the churches in the cities were looking towards England for their stimulus. Before the death of Anselm, Archbishop of Canterbury, in 1109, six bishops-elect from Ireland – four from Dublin and one each from Limerick and Waterford – were consecrated by the Archbishops of Canterbury and accepted the Archbishops of Canterbury as primate. For their part, when they looked at Ireland, two Archbishops of Canterbury, Lanfranc (d. 1089) and Anselm (d. 1109), identified specific faults in the Church, including simony, maladministration of the sacraments, and highly defective law of marriage. Anselm believed there were too many bishops in Ireland, and that these bishops had too little authority and not enough pastoral dynamism. He linked both these faults with the fact that the bishops had no defined territorial area in which to exercise their episcopal authority. So the Cistercian reforms on Continental Europe, introduced by Saint Bernard of Clairvaux, had a strong influence on the reforms introduced to Ireland in the 12th century. The foundation of the monastic houses was promoted by Archbishop Malachy of Armagh following the visit to Rome in 1139. Three years later, the Cistercians established their first house in Ireland in Mellifont, Co Louth, in 1142, and the Synod of Kells met there in 1152. By 1148, the Augustinian canons had had established over 40 communities in Ireland, and they were introduced to Christ Church Cathedral, Dublin, by Laurence O’Toole, when he became Archbishop of Dublin in 1162. The arrival of the Anglo-Normans in the second half of the 12th century, while Laurence O’Toole was archbishop, ushered in a period of further dramatic change and reform in Ireland. At the Council of Cashel in 1172, the Bishops of Ireland acknowledged before Henry II that further, sweeping reforms were needed, and Archbishop Gelasius of Armagh and Archbishop Laurence of Dublin, welcomed Henry II to their dioceses. 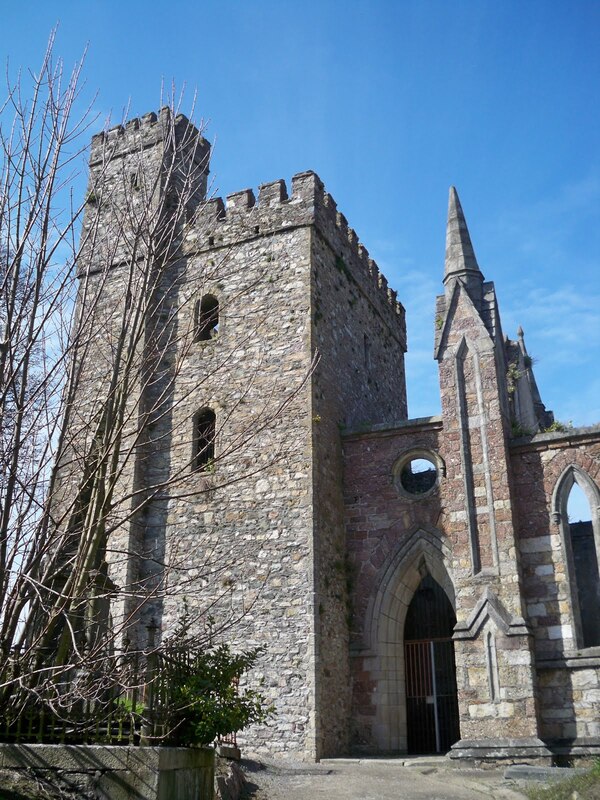 The face of the mediaeval church changed with the arrival in Ireland of the monastic houses and the mendicant orders. ● They also introduced major economic and educational reforms, in agriculture, land reclamation. The friars brought with them a revolutionary approach to the Church. At first they used the local parish churches, but they soon founded their own churches and houses. An interesting example of an early learned Irish Franciscan theologian and philosopher of the High Middle Ages may be John Duns Scotus (1266-1308). The name Scotus may indicate he was born in Ireland, and an entry the Franciscan library in Assisi dated 1381 refers to him as Irish. That entry designates Duns Scotus’s commentary on the Sentences of Peter Lombard as ‘magistri fratris Johannis Scoti de Ordine Minorum, qui et Doctor Subtilis nuncupatur, de provincia Hiberniæ’ (‘the work of master John Scotus of the Franciscan Order known as the subtle doctor, from the province of Ireland’). The prominent 16th and 17th century Irish Franciscans who translated his works, including Mauritius de Portu (O’Fihely), Hugh MacCaghwell, and Luke Wadding, also regarded Duns Scotus as Irish. However, he is also claimed by Duns in Berwickshire. Duns Scotus was known in the Middle Ages as Doctor Subtilis (‘Subtle Doctor’), and was one of the most important philosophers and theologians of the High Middle Ages. The 15th century saw a thorough-going reform and renewal movement in all four orders of mendicant friars in Ireland. About 90 new houses were founded in Ireland, many of them in Gaelic-speaking areas in Connacht and Ulster. What was the impact of the mendicant friars on the life of the Church in Ireland in these centuries before the Reformation? ● They changed the face of parochial life. ● They raised the expectations of the laity when it came to the education and skills of the parochial clergy. ● They challenged the attitudes of slack and ignorant clergy. ● Their loyalty to their orders, and through them, to the Pope challenged the episcopal and diocesan structures. Apart from the spread of the monastic and mendicant houses, another great factor in reform and change in the Irish Church was the Anglicisation of Ireland following the arrival of the Anglo-Normans, and which reached its peak within a century in the reign of Edward I (1272-1307). When 20 bishops from Ireland attended the Fourth Lateran Council in Rome in 1215, six or seven were English. By the end of the 13th century, about half the bishops in Ireland were English or from English families. Yet, in some parts of Ireland, the Gaelic Irish clergy tried to block English priests from being admitted to cathedral chapters, even when this was condemned by Pope Innocent IV. The mutual discrimination – which we could describe as an early form of apartheid – was enshrined in civil law and passed into legislation with 35 acts of parliament known as the Statutes of Kilkenny in 1366, reasserting the primacy of English culture, customs and manners. But, while the Statutes were sweeping in scope and aim, they never fully succeeded because the government did have the resources to fully implement them. While the public face of the Church in the High Middle Ages may have been the bishops and the male monks and mendicants, it should not be forgotten that women also played interesting roles in the development of life in the Church in Ireland. In late mediaeval western European society, women were, in the main, more profoundly religious than men. She shows that women played a key role in the development of the Church in both Gaelic and English-speaking areas, and she explores those by examining their religious beliefs, church patronage, funeral customs and their attitudes towards death and salvation. She has documented interesting examples of the inversion of gender authority roles that characterise church patronage in pre-Reformation Irish society. They were the organisers of pilgrimages, the founders of monastic and mendicant houses, and the benefactors of the poor, the clergy and scholars. They often had great collections of books, and were generous with their endowments. During these centuries of the High Middle Ages, we should not forget, there were other signs of truly religious life and great cultural awakenings in the Church in Ireland. Great manuscripts were being illuminated, great churches were being built, and they were being decorated with great windows. But by the 16th century, while the mendicant friars were totally identified with the people, particularly in the towns and cities, only handfuls of monks remained in the great Cistercian abbeys, and the church in general was failing to meet the needs of the people and was in need of reform. (Revd Professor) Canon Patrick Comerford is Lecturer in Anglicanism, Liturgy and Church History, the Church of Ireland Theological Institute. This essay is based on notes prepared for a lecture as part of the Reader Course Day Conference on 4 February 2017. Recently, in a session on Church History, we were looking at the arrival of Christianity in Ireland and the early development of the ‘Celtic’ or ‘insular’ church. One of the great achievements of the ‘insular’ church was the way it expressed Christianity in art, including illuminated manuscripts, carved stone High Crosses with their Biblical images, including images of the passion, and metalwork like the Ardagh Chalice, which was found in 1868 within the bounds of my new parish in the Diocese of Limerick. 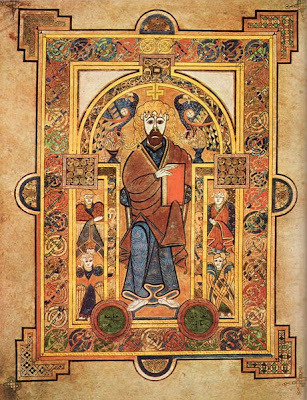 The great illuminated manuscripts produced in Ireland include the Book of Durrow (ca 650-700) and the Book of Kells (ca 800), both now in Trinity College Dublin, while the monasteries in England produced the Lichfield Gospels (or the Saint Chad Gospels, ca 730), in Lichfield Cathedral, and the Lindisfarne Gospels (ca 715), now in the British Library in London. It is interesting to note that these two English Gospels are both older than the Book of Kells. 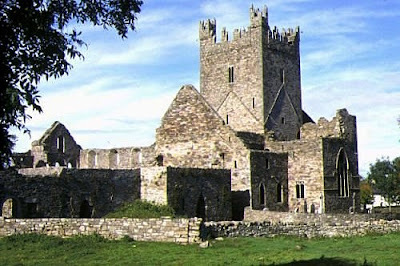 During the Dark Ages in Europe, Irish missionary monks and their monasteries were havens and sanctuaries for scholars and theologians, keeping alive Latin learning and the monastic schools in Ireland became centres of learning, attracting people from throughout Europe. The manuscripts and metalwork were produced by and for monasteries, yet these early forms of Christian art had profound influences beyond the monasteries on Western mediaeval art. But, of course, most of these great works of art were produced not for art galleries or private collections. They were produced for liturgical use, as processional crosses, processional Gospels, and so on. Just imagine a great procession in a mediaeval Gothic Cathedral – the music, the processional cross, the processional Gospel, the vessels and vestments, the choreography, the frescoes on the wall, the impact on your eyes, ears, nose and throat, are designed to stimulate your senses and draw your whole body, and not just your brain, into the fullness of the experience of worship. Is this going to be your your experience of worship in your parish church tomorrow morning? 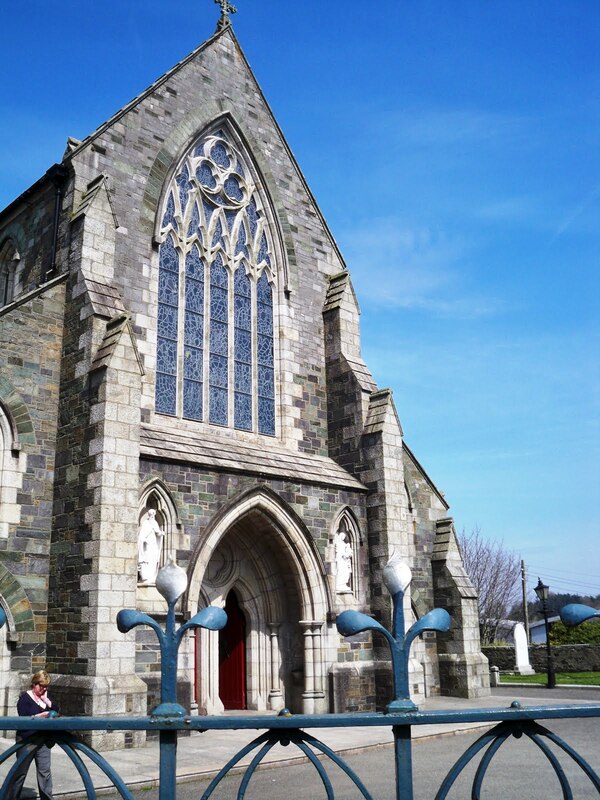 Are we afraid to stimulate more than our brains and our intellect in the Church of Ireland in our worship today? What are the objections, or the obstacles? People will come to your churches to see the windows, or a painting, or the Telford organ, or the carved pews. Who can deny that these are religious experiences? Over the course of your ministry, you will hear from many people of who have had deeply spiritual experiences as they encountered great works of art: Carravagio’s Taking of the Christ in the National Gallery of Ireland in Dublin or Michelangelo’s ceilings of the Sistine Chapel in Rome, for example. 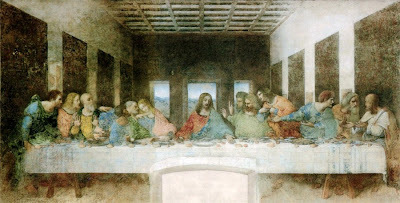 We are all aware of how the spiritual message of Leonardo da Vinci’s Last Supper has been misused in promoting Dan Brown’s Da Vinci Code. 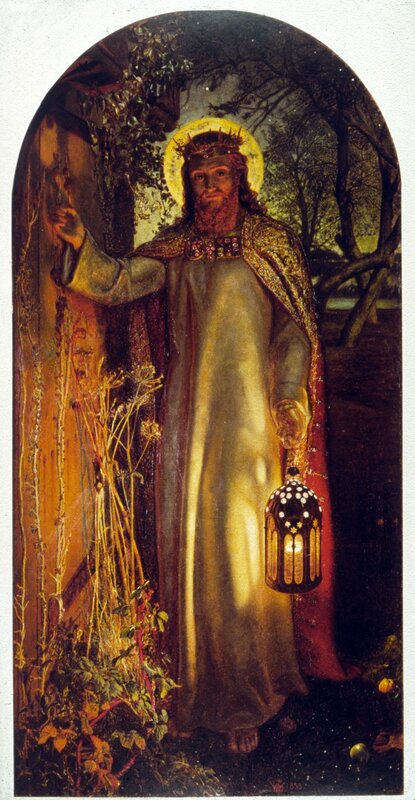 But think of how many people visit Saint Paul’s Cathedral in London solely to see William Holman Hunt’s The Light of the World. For me, this is the first image of Christ that I remember from my childhood, an image first shown to me in a book by my grandmother. But works of art that are less well-known also have a strong impact on people, and often during the first encounter. Although many of our churches have large east windows, this is the place for great works of art in, for example, the chapels of many colleges in Oxford and Cambridge, or in Lutheran churches throughout Scandinavia and Germany. So is there such a subject as Christian art? And what is the place of Christian art in our churches, in our use of Sacred Space? Does it have any connection with how we worship, with our liturgy? Christian art is sacred art that seeks to illustrate, supplement and portray the principles of Christianity. Today, most Christian groups use art to some degree. But there are strong objections to some forms of religious images, and there are major periods of iconoclasm in the past. Which forms of Christian art do you find yourself feeling most comfortable about? And which forms of Christian art do you find yourself feeling most uncomfortable about? ● Cheap kitsch popular devotional prints. To what degree is your taste or distaste related to the subject matter? You may think portrayals of saints and their representation in statues are much rarer in Anglican and Protestant traditions than in Roman Catholicism and Eastern Orthodoxy traditions. But think of the carved statues on the west fronts of Westminster Abbey or Lichfield Cathedral. What do you think of the place of Moses and David by Michelangelo in Florence in shaping our understanding of key figures in the Old Testament? Christianity makes a greater use of images than the other two principal monotheistic faiths, Judaism and Islam, which discourage and even forbid the use of religious imagery. ●The oldest surviving Christian paintings, from Megiddo, date from around the year 70. ●The oldest Christian sculptures are early 2nd century sarcophagi. 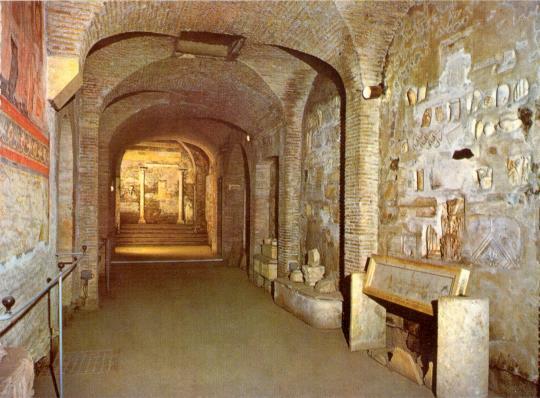 ● The largest groups of Early Christian paintings come from the tombs in the Catacombs of Rome. ● The oldest image of Christ we have is the Icon of Christ from Saint Catherine’s Monastery on Mount Sinai – there is a copy in the chapel. However, Christian art is not only religious. It speaks to, informs and influences the development of art in Europe after the fall of the Roman Empire, and the Church became one of the greatest patrons of art. In Byzantine Christian art, the primary purpose was to convey religious meaning rather than the accurate representation. The controversy over the use of graven images, the interpretation of the Second Commandment, and the crisis of Byzantine Iconoclasm led to a standardisation of religious imagery in the Eastern Orthodoxy. The fall of Constantinople in 1453 brought an end to the highest quality Byzantine art, produced in workshops in Constantinople and, most notable, in the school in Crete. Yet Orthodox art has since continued with relatively little change in subject and style. In Western Europe in the Middle Ages, the Church commissioned paintings and sculptures, and until the Reformations, Christian art continued to be commissioned in great quantities by the churches, clergy and the aristocracy. The Reformation brought a virtual halt to the production of public Christian art in many European countries, and saw the destruction of great works of art in churches, monasteries and religious foundations. In Roman Catholic countries, the Church role in commissioning art continued, and, this increased with the Counter-Reformation. From the 18th century, the number of religious works by leading artists declined sharply, although important commissions continued, and some artists continued to produce large bodies of religious art on their own initiative. Examples of these include the Pre-Raphaelites in 19th century Victorian Britain. By the end of the 19th and beginning of the 20th century in Western Europe, some secular artists treated Christian themes, but only rarely was a Christian artist, such as Stanley Spencer, regarded as culturally significant. However, in recent decades there has been a resurgence in religious art, with many modern artists, both Jewish and Christian – such as Eric Gill, Marc Chagall, Henri Matisse, Jacob Epstein and Graham Sutherland – producing well-known works of art for churches. Dante Rossetti studied at the Royal Academy, where he met William Holman Hunt and John Millais, and together they formed the Pre-Raphaelite Brotherhood in 1848. Rossetti’s first Pre-Raphaelite paintings in oils, based on religious themes and with elements of mystical symbolism, were The Girlhood of Mary Virgin (1849) and The Annunciation: Ecce Ancilla Domini (1850), both in the Tate Gallery, London. 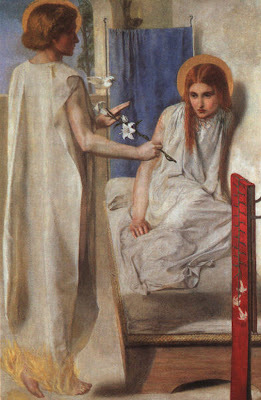 Rossetti’s The Annunciation was first exhibited at the Royal Academy, along with works by Millais and Holman Hunt, all with Christian themes. In this painting, white dominates, only relieved by small areas of blue, red and yellow. This emphasises the quality of the Virgin Mary’s purity. The Archangel Gabriel offers Mary a lily – a flower that always denotes purity when shown alongside the Virgin Mary – as he tells her she is to bear the Christ child. But what is unusual about this painting? What was controversial about it? Did you notice how Mary is shown in a state of fear? How she is cowering against the wall and casting her eyes down? This portrayal of Mary contrasts with many artistic depictions of the annunciation, where she is shown in a state of humble acceptance. In painting his Annunciation in such a realistic manner, Rossetti was breaking with tradition. Italian Renaissance artists had painted the Virgin Mary as a holy figure, isolated and set aside from ever-day life. But in this work, she is an ordinary Mary, an every-day girl bewildered by the news she has just hear from the Angel Gabriel. And, as you can image, large sections of the public were enraged. How might you use this painting to give fresh meaning and understanding to the Canticle Magnificat at Evensong? The English artist Stanley Spencer (1891-1956) believed that the divine rested in all creation. His earthy Christian faith and his preoccupation with death and resurrection are reflected in many of his works. The Resurrection, Cookham is the first of a great series of resurrection paintings. The entire population of the village – including Spencer – is seen popping out of their graves in the churchyard, looking as dapper as ever, squinting in the sunlight of a bright sunny day – just like today. Christ is enthroned in the church porch, cradling three babies, with God the Father standing behind. Spencer appears near the centre, naked, leaning against a grave stone. His fiancée Hilda Carline – whom he married in 1925 while working on this painting – lies sleeping in a bed of ivy. At the top left, we can see risen souls being transported to Heaven in the pleasure steamers that then ploughed along the River Thames. But do you notice anything odd here? This is a resurrection without a last judgment. It seems everyone in Cookham is to be forgiven their sins. 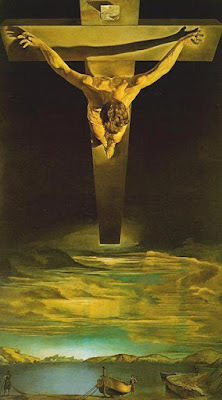 The Christ of Saint John of the Cross was painted by the Spanish surrealist Salvador Dalí (1904-1989) in 1951, and is probably the best-known modern painting of the Crucifixion. The painting shows Christ on the cross in a darkened sky floating over a body of water complete with a boat and fishermen. The people beside the boat are derived from a picture by Le Nain and from a drawing by Velazquez. But the painting takes its theme, inspiration and title from a drawing by the 16th century Spanish Carmelite mystic Saint John of the Cross, in which Christ is depicted as if seen from above. That work is now in the convent in Avila. Although this is a depiction of the Crucifixion, did you notice how there are no nails, blood, wounds, or crown of thorns? Dalí said he was convinced in a dream that these features would mar his depiction of Christ. Secondly, take a look at the angle that we are asked to see Christ from. Once again, Dalí said that in a dream he was revealed the importance of depicting Christ in this extreme angle. In 1961, the canvas was damaged by a visitor to the museum who threw a brick at it. He later explained his action, saying the viewpoint of the artist was looking down on rather than up at Christ on the Cross. Thirdly, notice how the composition of Christ is based on a triangle and circle. The triangle is formed by Christ’s arms; the circle is formed by Christ’s head. What is the artist saying here? 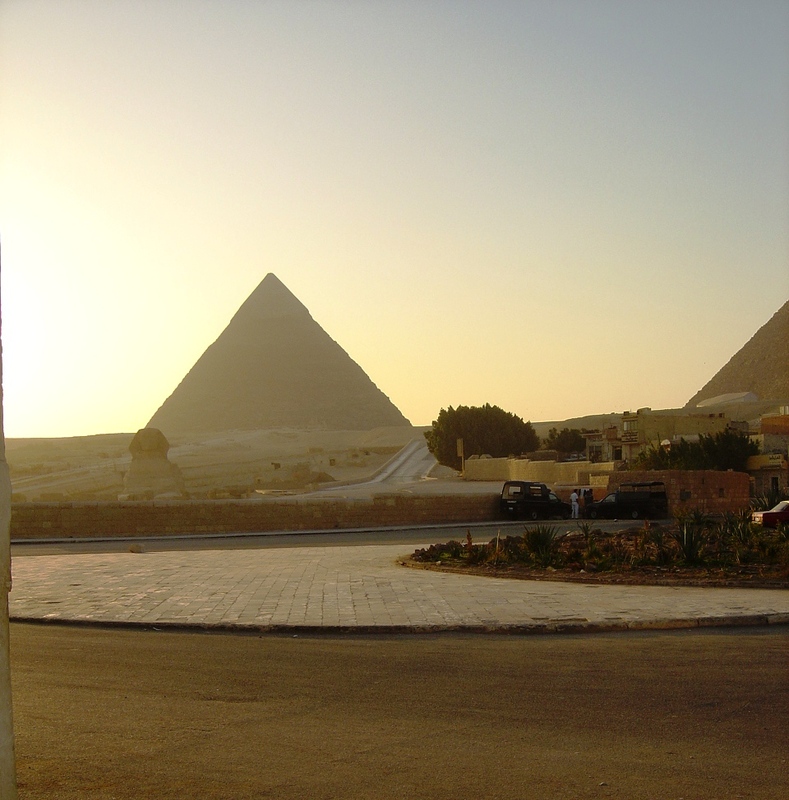 The triangle, since it has three sides, can be seen as a reference to the Trinity. The circle may be an allusion to Platonic thought. This painting now hangs in the Kelvingrove Art Gallery and Museum, Glasgow, and has been voted Scotland’s favourite painting. Which images of the cross are acceptable in your church? Which images of the cross are not acceptable in your church? 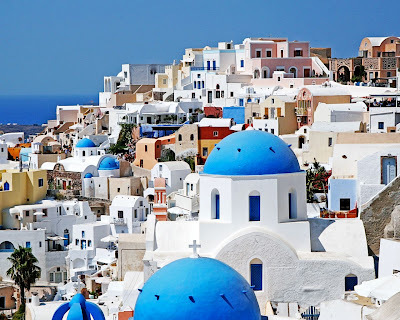 For most people on these islands, when we close our eyes and think of the shape of a church, we think of Gothic revival parish churches or cathedral, with their pointed windows, towers and steeples, side aisles and sanctuaries. From the first century to the early fourth century, most Christian communities worshipped in private homes, often secretly. Some Roman churches, such as the Basilica of San Clemente in Rome, are built directly over the houses where early Christians worshipped. With Constantine’s victory at the Battle of the Milvian Bridge over 1,700 years ago, on 28 October 312, Christianity became first a lawful religion and then the privileged religion of the Empire. This freedom gave freedom in the expressions of architecture, and the new buildings were modelled on the patterns of civic and imperial buildings. The basilica, with its large rectangular meeting hall, became the model for new churches in both the East and the West, with a nave and aisles, and sometimes with galleries and clerestories. Roman basilicas were large vaulted buildings with high roofs, braced on either side by a series of lower chambers or a wide arcaded passage. At either end, a basilica had a projecting apse, a semi-circular space roofed with a half-dome, where the magistrates sat in court. The first large churches were in Rome and had their origins in the early 4th century. Several churches in Rome, such as Santa Maria Maggiore (Saint Mary Major), San Giovanni in Laterano (Saint John Lateran) and Santa Constanza, date from the fourth century. Another influence on early church architecture was the mausoleums of Roman nobles, which were square or circular domed structures built to house a sarcophagus. Early examples include the adaptation of the imperial mausoleum, the Rotunda, in Thessaloniki, which became a church, and the circular Church of the Holy Sepulchre, built by Constantine in Jerusalem. Later examples include the Temple Church in London and the Round Church in Cambridge, and the shape of a former round church in Dublin, Saint Andrew’s, can still be traced in the semi-circular street line from Suffolk Street into Saint Andrew Street around the perimeter of the later Gothic Revival building. But, you can see from this introduction, that we still need to ask whether our liturgy should shape our buildings, or whether our buildings force the shape of our liturgy. But we could say that in the post-Reformation and post-Trent period, all traditions in the Church came to emphasise full and active participation in the liturgy and public worship, even if there were different understandings of how this was attained. To a lesser degree, this was the experience in many Anglican cathedrals and churches too. There is a clear comparison between the architecture of Saint Peter’s in Rome and Saint Paul’s in London … Peter and Paul, Rome and London, the old empire and the new empire find their apostolic centres of worship. At the Second Vatican Council, the decree Sacrosanctum Concilium (December 1963) encouraged ‘active participation’ (participatio actuosa) in the celebration of the liturgy by the people and required that new churches should be built with this in mind (#124). A ‘market place’ theology suggested building multi-purpose churches, with secular and sacred events sharing the same space, albeit at different times. Saint Augustine … did he ever say ‘He who sings, prays twice’? Of course we can say that singing and music enhance our worship, prayers and liturgy, especially on Sundays. Just imagine how deadpan our Sunday Eucharist would be without hymns. But why do we not also sing the Kyrie, Gloria, Creed, Sanctus and Benedictus, and Agnus Dei? Sung and Vested Evensong in the chapel here on Thursdays during term time falls flat without singing at least two canticles, Magnificat and Nunc Dimittis. 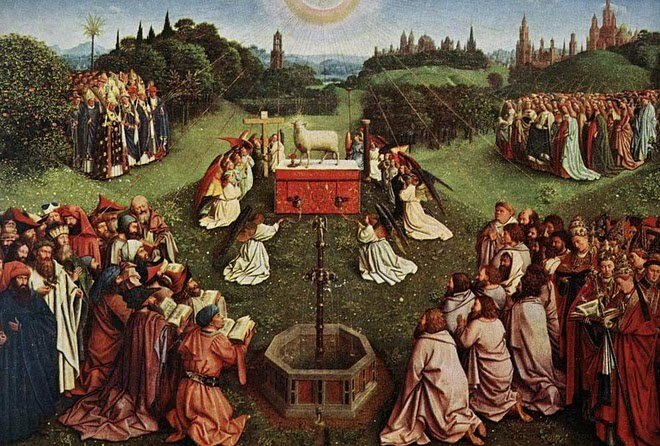 Singing canticles and the set parts of the Eucharist seem so natural to many of us as Anglicans that we almost become proprietorial about them, thinking they are quintessentially Anglican, and forgetting both their Biblical and historical roots and the Biblical and historical roots of liturgical music. Music can go places where words can never go. It can touch, and heal, and liberate us in ways that theology can only stand back and envy. We can trace Church Music back to Biblical roots and the music of the Temple and the synagogue. It seems so natural that Anglican liturgical texts that are based on the Psalms and the Psalter should be such a major part of the Book of Common Prayer in all its shapes and editions. According to the Mishnah, the Temple orchestra consisted of 12 instruments, and the choir had 12 male singers. A number of additional instruments were known to the ancient Hebrews, though they were not included in the regular orchestra of the Temple, including: the uggav (small flute) and the abbuv (a reed flute or oboe-like instrument). Of course, these restrictions were relaxed later. Jewish music began to crystalise into definite form with the piyyutim or liturgical poems. The cantor sang these poems to melodies selected by their writer or by himself, introducing fixed melodies into synagogue music. The music may have preserved a few phrases in the reading of Scripture that recalled songs from the Temple itself. The earliest music in synagogues was based on the same system as the system used in the Temple in Jerusalem. The only record of communal song in the Gospels is at the end of the Last Supper, when Christ and the disciples sing hymns before going out to the Mount of Olives (Matthew 26: 30). 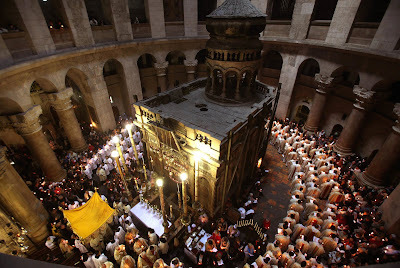 The first Christians continued to attend the Temple in Jerusalem and the synagogues. Can we presume the same musical traditions were carried over into separate Christian meetings? The earliest Christian hymns are mentioned by Saint Paul in his letters, where he encourages the Ephesians and Colossians to use psalms, hymns and spiritual songs (see Ephesians 5: 18-19; Colossians 3: 16). In his vision in the Book of Revelation, Saint John the Divine describes seeing the four living creatures with six wings, gathered around the throne and never ceasing to sing day and night (Revelation 4: 8) – an echo of Isaiah’s vision (Isaiah 6: 2-3), but they are singing rather than saying their praises – and they are joined by the 24 elders in singing too (see Revelation 4: 10-12), the saints who sing a new song (Revelation 5: 9-10), and the angels, living creatures, myriads and myriads, and thousands of thousands, “singing with full voice (Revelation 5: 11-12), and every creature “in heaven and on earth and under the earth … singing (Revelation 5: 13). And the singing goes on (Revelation 7: 12) and on (Revelation 11: 17-18), and on (Revelation 15: 3-4) … and on. There’s a lot of singing in the heavenly worship described in the Book of Revelation. Saint Ignatius of Antioch (died 107) had a vision in which the angels were singing in alternate choirs. The Greek hymn Φῶς Ἱλαρόν (Phos Hilaron), Hail gladdening light was mentioned by Saint Basil around 370. Latin hymns appear at around the same time, influenced by Saint Ambrose of Milan. Prudentius, a Spanish poet of the late 4th century was one of the most prolific hymn writers of the time. Early Celtic hymns, associated with Saint Patrick and Saint Columba, including Saint Patrick’s Breastplate, are traced by some sources to the 6th and 7th centuries. Hymnody in the Western church introduced four-part vocal harmony as the norm, adopting major and minor keys, and came to be led by organ and choir. The introduction of church organ music is traditionally believed to date from the time of Pope Vitalian in the sixth century. Gregorian chant is the main tradition of Western plainchant, a form of monophonic liturgical chant of Western Christianity that accompanies the celebration of the Eucharist and other services. This musical form originated in monastic life, in which singing the hours nine times a day was part of the Rule of Saint Benedict. Singing psalms made up a large part of the life in a monastic community, while a smaller group and soloists sang the chants. Gregorian Chant has gone through many gradual changes and reforms. It was organised, codified, and notated mainly in the Frankish lands of western and central Europe in the 12th and 13th centuries, with later additions and redactions. But the texts and many of the melodies have antecedents going back several centuries earlier. 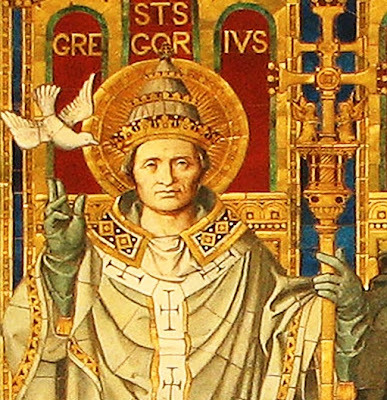 Although popular belief credits Pope Gregory the Great with introducing Gregorian chant, scholars now believe that Gregorian chant began as a later Carolingian synthesis of Roman and Gallican chant. Polyphonic music arose from the venerable old chants in the Organa by Léonin and Pérotin in Paris (1160-1240), and ended in monophonic chant. In later traditions, new composition styles were practised alongside monophonic chant. Although chant had mostly fallen into disuse after the Baroque period, it went through a revival in the 19th century in the Roman Catholic and Anglo-Catholic traditions. Mass settings are found in and shared by the liturgical traditions of Roman Catholics, Anglicans and Lutherans, and there are many Mass settings in English in the Anglican tradition. 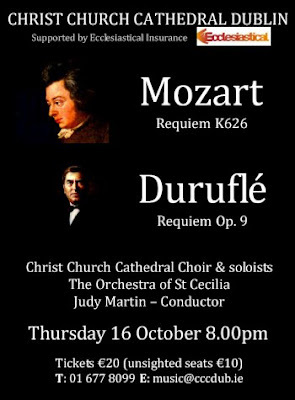 The Requiem Mass has a long tradition in Western liturgical music, with requiems by Palestrina, Victoria, Mozart, Berlioz, Brahms, Bruckner, Fauré, Liszt, Verdi, Benjamin Britten, Duruflé, Stravinsky and others. The Reformation created two conflicting attitudes to hymns. Many Zwinglians, Calvinists and other radical reformers, considered anything that was not directly authorised by the Bible to be a novel and a Catholic introduction to worship that was to be rejected. All hymns that were not direct quotations from the Bible fell into this category. They were rejected, along with instrumental musical accompaniment. Organs were removed from churches, and hymns were replaced by chanted Psalms, often unaccompanied. This is a tradition that has continued to this day among the “free churches” of western Scotland. The second Reformation approach, favoured by Martin Luther, produced a burst of hymn writing and congregational singing. Luther and Lutherans often used their hymns, or chorales, to teach the faith. In the century or two after the Anglican Reformation, Anglican theology was developed not only by academic theologians and bishops, but by poet-priests such as John Donne and George Herbert, by architects, and by composers. 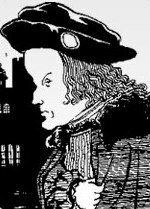 1, John Taverner (ca 1490-1545) is regarded as one of the most important English composers of his era. Most of Taverner’s music is vocal, and includes masses, Magnificats and motets. Most of his works were probably written in the 1520s. 2, Thomas Tallis (ca 1505-1585) is considered the father of English choral music. Tallis occupies a primary place in anthologies of English church music, and is considered one of England’s greatest early composers. He is honoured for his original voice in English musicianship, and is also remembered as the teacher of William Byrd. 3, John Marbeck (ca 1510–ca 1585) produced a standard setting of the Anglican liturgy. In the 19th century, the Oxford Movement inspired renewed interest in liturgical music, and the Irish-born John Jebb drew attention to Marbeck’s Prayer Book settings in 1841. In 1843, William Dyce published plainsong music for all Anglican services, with almost all of Marbeck’s settings, adapted for the 1662 Book of Common Prayer. Later in the 19th century, many editions of Marbeck’s settings were published, especially for the Holy Communion, with arrangements by noted musicians including Sir John Stainer and Charles Villiers Stanford. 4, William Byrd (1539/1540-1623) was a Renaissance composer who wrote in many of the forms current in England at the time, including various types of sacred and secular polyphone, keyboard and consort music. Byrd played a role in the emergence of the new verse anthem. His four Anglican service settings range in style from the unpretentious Short Service to the magnificent Great Service. The setting for the Eucharist we are taking part in this morning in Christ Church Cathedral Dublin is Byrd’s Mass for Five Voices. 5, Orlando Gibbons (1583-1625) was one of the most versatile English composers of his time. One of the most versatile English composers of his time, he wrote a quantity of keyboard works, around 30 fantasias for viols, a number of madrigals, and many popular verse anthems. His choral music is distinguished by his complete mastery of counterpoint, combined with his wonderful gift for melody. He produced two major settings of Evensong, the Short Service and the Second Service. 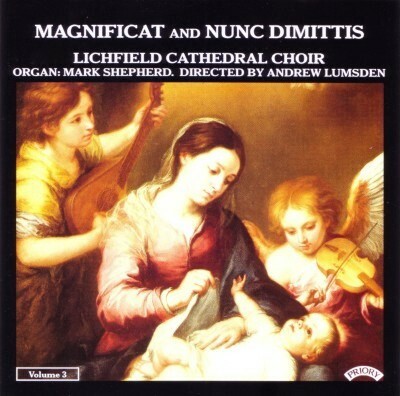 The former includes a beautifully expressive Nunc Dimittis, while the latter is an extended composition, combining verse and full sections. 6, Thomas Tomkins (1572-1656) was a prolific composer of verse anthems in the late Tudor and early Stuart period. His life links the great Anglican composers of the Tudor and Stuart eras with the Laudian era and the Caroline Divines. Tallis, Merbecke and Byrd are honoured, together with a feast day on 21 November in the liturgical calendar of the Episcopal Church. All six have contributed immeasurably to the corpus of Anglican liturgical music. The earlier English writers tended to paraphrase biblical texts, particularly Psalms. Isaac Watts followed this tradition, but is also credited as having written the first English hymn which was not a direct paraphrase of Scripture. Charles Wesley’s hymns helped to promote the spread of Methodist thinking far beyond the boundaries of Methodism. 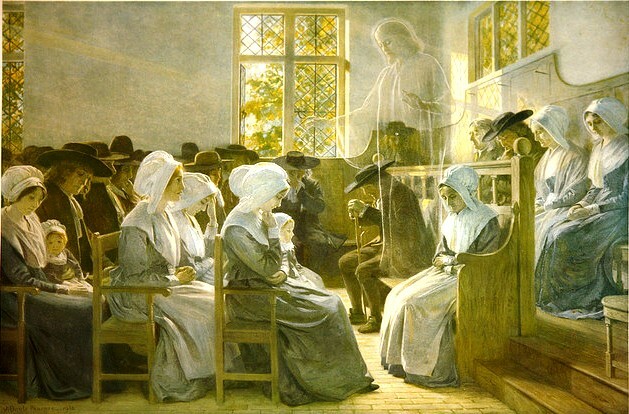 The Methodist Revival in the 18th century created an explosion of hymn that continued into the 19th century. 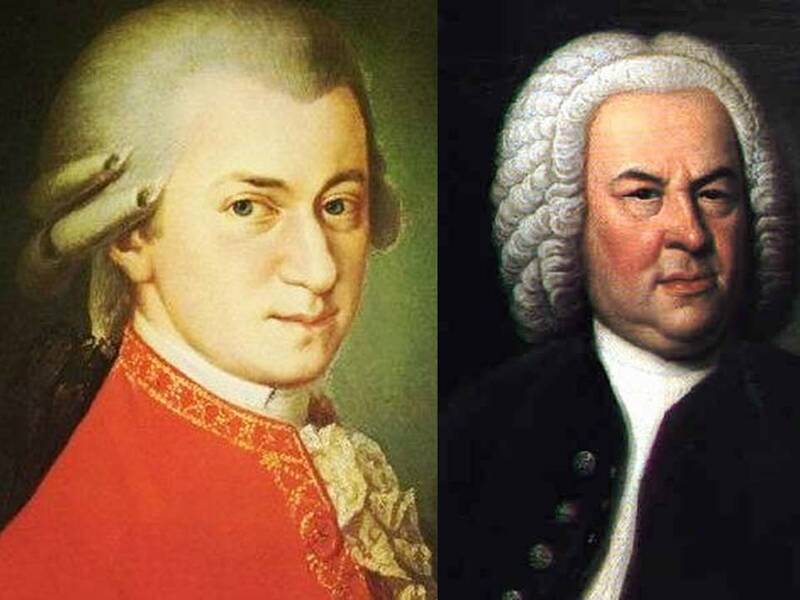 Mozart and Bach ... does anybody know who was Catholic and who was Protestant, and does anyone care? Bach or Mozart? Does anybody know, or does anyone care whether Mozart or Bach was a Catholic or a Protestant? Johann Sebastian Bach (1685-1750) saw himself not as a genius but as one of God’s craftsmen. Music should, he wrote, have no aim other than the glory of God and the ‘re-creation of the soul … Where this is not kept in mind there is no true music, but only an infernal clamour and ranting.’ His scores bear dedicatory abbreviations like ‘SDG’ (Soli Deo Gloria, ‘To God alone be praise’) or ‘JJ’ (Jesu Juva, ‘Help me, Jesus’). May I offer another version of that quote from Karl Barth: ‘Whether the angels play only Bach praising God, I am not quite sure. I am sure, however, that en famille they play Mozart.’ Indeed, it is said that wittily that Barth lived with lifelong guilt that he liked Mozart better than Bach. Towards the end of his life, Barth even experienced his first and only mystical vision – a vision of Mozart gazing at him benignly from the stage during a concert. Hans Urs von Balthasar was very impressed by this vision. Barth once had a dream in which he was supposed to give Mozart an oral examination in theology. He knew in advance that ‘under no circumstances would [the composer] be allowed to fail.’ And so he did everything he could to make things easy for him; he filled the exam with friendly prompts and hints about his masses. But in answer to Barth’s question about Dogmatics and ‘Dogma’ and what they might mean, Mozart’s response was total silence. Perhaps the Mozart of Barth’s dream had the right idea. Why worry about 13 volumes of Dogmatics when you can write a mass, a symphony, a serenade? We can imagine him inwardly chuckling at a theologian’s questions. (Revd Professor) Patrick Comerford is Lecturer in Anglicanism, Liturgy and Church History, the Church of Ireland Theological Institute. This lecture was part of the Reader Course Day Conference Programme on 4 February 2017.